I dislike taking the spotlight from Stepan Sarpaneva here, but I’d really like to start out this particular post by singing the praises of the latest non-watchmaker shooting star of the modern horological world: Black Badger Advanced Composite’s James Thompson. Thompson, a 40-year-old native of Ottawa, Canada who now lives in Sweden has made quite a splash among watch enthusiasts . . . despite not even having his own watch. 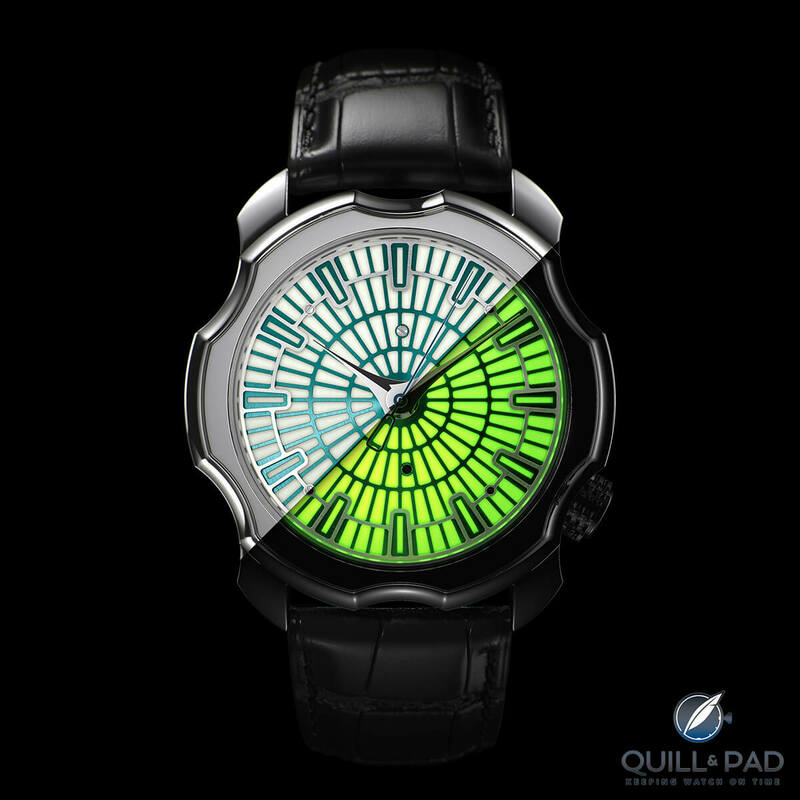 His first watch collaboration came about after having attended the 2012 edition of SalonQP. “A friend was wearing one of my Eclipse carbon and glow rings while working at the Bell & Ross stand,” Thompson recalls. It was then that Giles Schofield of Britain’s Schofield Watches saw the ring and jumped right to engage Thompson to co-create the Schofield Blacklamp. The watch that emerged with Finnish watchmaker and goldsmith Sarpaneva made its debut at the 2015 edition of Baselworld. Called Korona K01 Northern Lights, it was truly a ray of light at the gargantuan fair (see Stepan Sarpaneva’s Striking Korona K0 Northern Lights) despite its very limited quantity. The 24 watches available in three colors sold out quickly, so much so that Sarpaneva released another eight-piece edition in a gold case at SalonQP 2015. At the 2016 edition of Baselworld, three different new timepieces are set to be introduced with glowing Black Badger Advanced Composite elements. One of them is Sarpaneva’s Seasons (you will find out what the other two are once the fair opens on March 16). Thompson’s company Black Badger creates jewelry using solid blocks of lume, carbon fiber, and titanium. The high-tech rings are an idea that actually originated with his engineer father. In Canada, engineers then didn’t receive a gold watch upon graduation, but rather an iron ring. Using solid lume was an idea that came from knife maker John Gonzalez’s Dervish Knife handles. “They looked cool.” While this is not all that Black Badger includes in its portfolio of products, the glowing rings are definitely the company’s most popular item. In a technical sense it is important to understand that the luminous substance is not like Super-LumiNova in that it is not applied or painted. It is a solid material. It is a material that a designer can “sculpt” with, and it is 40 percent brighter and longer lasting than Super-LumiNova. Sarpaneva’s new Seasons models created with the help of Black Badger Advanced Composites pay artistic homage to the strongly differing seasons that take place in Finland. The dials comprise two parts: a stainless steel grid coated with either DLC or TiN placed above the solid block of lume in teal, green, violet, or blue. The hour and minute hands are rhodium-plated, polished, and matt-blasted, while the second hand is crafted in blued steel. One huge difference to the previous edition is the case back, which features Sarpaneva’s signature moon face. While he officially communicates that the steel relief engraving is a tribute to the art of traditional pocket watch reliefs common more than a century ago, I am convinced that he put the face there to please his loyal following of collectors since it is uncharacteristically absent from the front of the watch. Thankfully, though, the luminous ones with moon face caricatures continue to exist. For more information, visit www.sarpanevawatches.com/seasons.